So you want to be a playa medic? Working with ESD Medical is an amazing experience that can be life changing! 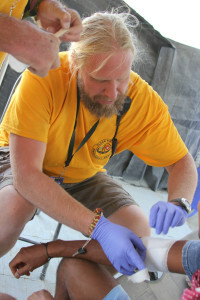 We provide free medical care in one of the most exotic, rugged cities in the world. Each year we welcome many medical care professionals to join our team. And they don’t regret it! You are licensed in the state of Nevada. For those with a Nevada license, ESD still requires one year of experience in your field of practice and no actions against that license within the prior five years. You must carry a license of EMT-B or higher in the United States or its Territories. Doctors, Nurses, LVNs, NPs, Paramedics and other licensed practitioners are all welcome to apply. Unfortunately, the state of Nevada will not allow us to accept out of country licenses per NRS 629.450. We also cannot accept certificates, such as Wilderness First Responder, Certified Nurse Assistant, Respiratory Therapist, etc. as certificates are not allowed per state regulations. This means, if your license has been suspended or revoked for any reason within the last five years, Nevada statute prohibit us from utilizing you on our team. So for instance, if you have an EMT-B but don’t consistently utilize those skills by working or volunteering as an EMT in your home town, or you are a nurse or doctor but you retired from practice, you cannot provide care for patients in Black Rock City unless you obtain a Nevada license. Again, a Nevada NRS 629 thing. Be ready by completing the ICS 100 and 700 classes online. These classes are required of ALL ESD volunteers. If you are interested in working in any of our field positions (QRVs, RIT teams, Thunderdome), you will also need ICS 200. Also, if you will be driving a QRV or other ESD vehicle as a part of your job you need to have a valid Driver’s License. And everyone needs a current CPR card. Due to the type of care we provide on playa, we are more apt to onboard health care providers with strong emergency and/or field experience. Despite the above strict parameters, we in ESD do not practice above a basic first aid level at the event. So that means, we can offer bandaids and eye wash, a cool glass of water and some advice, but we don’t start IVs, suture, dispense medications, etc. We hire an ALS vendor for that. Playa hoof you say? Yes, we can help with that! Stations are staffed with volunteers who meet the criteria above. They are preferentially staffed with nurses, doctors, PAs, etc with a solid background a emergency and family medicine. QRVs respond to calls in the city and on the open playa, occasionally bringing participants to Rampart, our advanced level care facility. QRVs are typically staffed by medics, although we do have some experienced clinical volunteers staffing them also. Radio use proficiency and situational awareness in the field are a must when working on the QRVs. These volunteers are licensed medical practitioners who transport minor injuries needing a higher level of care than we can provide at the stations. Think UTI, simple sutures, minor x-rays, eye infections, etc. These volunteers provide care to participants at the big burns like the Man and Temple burns. We team up a field volunteer and clinical volunteer for these shifts, outfitting them with a jump bag and radio. RIT shifts always start with a briefing in the Fire Camp behind Station 3 at 4 p.m. The RITs are then shuttled out to the burns. Sanctuary is a chill space located behind Ranger Headquarters at 5:30 and Esplanade. ESD Sanctuary volunteers work along side Rangers to provide support to and medical evaluation of participants who have ended up in Sanctuary as a result of undergoing inner transformation or experiencing internal or emotional distress. Ideally, ESD Sanctuary volunteers have both clinical and mental health care experience. Medical support for the Deathguild Thunderdome extravaganza. These are our volunteers who do not meet the criteria above but wish to work with ESD. They may be working towards obtaining a license (e.g. medical school, nursing school, etc), be new to their profession (less than three years experience), or hold a license or certificate in a healthcare profession providing ancillary care such as XR Tech or Respiratory Therapist. They may be a health care provider from a different country, so they don’t qualify to volunteer in the state of Nevada. Greeters assist the patients and staff but do not provide direct patient care.